Melissa Haviland and David Colagiovanni will be working with Small Craft Advisory Press and the Facility for Arts Research for three weeks on the creation of a 25 foot long artist book, “Music for Teacups”, which includes a 7 inch EP. 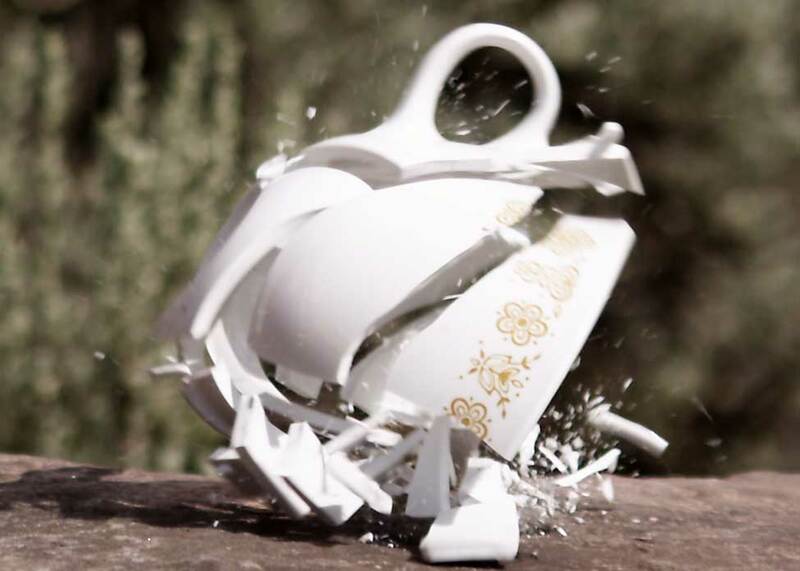 “Music for Teacups” is a composition in image and sound that recombines captured footage of falling and breaking teacups. The work explores issues of class, privilege, constraint, manners, family and beauty using a confined yet complex language. Haviland and Colagiovanni are artists who live and collaborate in Athens, Ohio and Carrboro, NC. Haviland’s artwork straddles the boundaries between printmaking and installation-performance exploring lineage, ritual, and practice within objects that are gendered and classed. Colagiovanni is a video and sound artist with interests in the reconfiguration of image and sound and the effects of gravity and immersion in virtual and physical space. He is currently the Artist in Residence at the Morehead Planetarium and Science Center. Colagiovanni and Haviland’s collaborative work includes artist books, zines, video and sound composition, photography, printmaking and music releases. During the Summer of 2011 the two began work on “Dinner Music”, which featured seven full sets of china recorded in slow motion video and audio falling and breaking on to a dinning room table in a field in rural North Carolina. Upcoming and recent releases include a 12 inch LP for the “Dinner Music” project and “Coupling” a compilation CD and Book based on the work of Stan Brakhage from Silent Media.